Ellen G. White in Vision: "I Am Quite Certain That She Did Not Breathe"
"I Am Quite Certain That She Did Not Breathe"--M. G. Kellogg, M.D. "I am quite certain that she did not breathe at that time while in vision, nor in any of several others which she has had when I was present. The coming out of the vision was as marked as her going into it. The first indication we had that the vision was ended, was in her again beginning to breathe. She drew her first breath deep, long, and full, in a manner showing that her lungs had been entirely empty of air. After drawing the first breath, several minutes passed before she drew the second, which filled the the lungs precisely as did the first; then a pause of two minutes, and a third inhalation, after which the breathing became natural." Signed, "M. G. Kellogg, M.D., Battle Creek, Mich., Dec. 28, 1890." "A physician was present, and made such examination of her as his wisdom and learning dictated, to find the cause of the manifestation. A lighted candle was held close to her eyes, which were wide open; not a muscle of the eye moved. He then examined her in regard to her pulse, and also in regard to her breathing, and there was no respiration. The result was that he was satisfied that it could not be accounted for on natural or scientific principles." Signed, "F. C. Castle." "I was then seventeen years old. It seems to me I can almost hear, those thrilling shouts of 'G-l-o-r-y!' which she uttered. Then she sank back to the floor, not falling, but sinking gently, and was supported in the arms of an attendant. Two physicians came in, an old man and a young man. 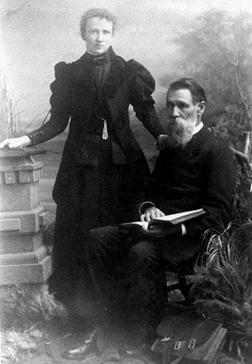 Brother White was anxious that they should examine Sister White closely, which they did. A looking-glass was brought, and one of them held it over her mouth while she talked; but very soon they gave this up, and said, 'She doesn't breathe'. Then they closely examined her sides, as she spoke, to find some evidence of deep breathing, but they did not find it. As they closed this part of the examination, she arose to her feet, still in vision, holding a Bible high up, turning from passage to passage, quoting correctly, although the eyes were looking upward and away from the book. "She had a view of the seven last plagues. Then she saw the triumph of the saints, and her shouts of triumph I can seem to hear even now. To these facts I freely testify." Signed, "Elder D. H. Lamson, Hillsdale, Mich., Feb. 8, 1893." "I remember the meeting when the trial was made, namely, to test what Brother White had frequently said, that Sister White did not breathe while in vision, but I cannot recall the name of the doctor who was present. . . . It must have been Doctor Fleming, as he was the doctor called sometimes for counsel. He is, however, now dead. I can say this much, that the test was made and no sign of breath was visible on the looking-glass." Signed, "Drusilla Lamson, Clifton Springs, N.Y., March 9, 1893." "This is to certify that I have read the above testimonials of David Lamson and Mrs. Drusilla Lamson, concerning the physician's statement when examining Mrs. E. G. White while she was in vision, June 26, 1854. I was present at that meeting, and witnessed the examination. I agree with what is stated by Brother and Sister Lamson, and would say further that it was Doctor Fleming and another younger physician who made the examination. After Mrs. White rose to her feet, as they have stated, quoting the text of Scripture, Doctor Fleming called for a lighted candle. He held this candle as near her lips as possible without burning, and in direct line with her breath in case she breathed. There was not the slightest flicker of the blaze. The doctor then said, with emphasis, 'That settles it forever, there is no breath in her body' ". Signed, "David Seeley, Fayette, Iowa, Aug. 29, 1897." 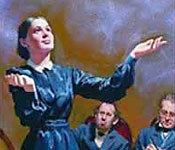 "We were present when (in February, 1857) Sister E. G. White had a vision in Waldron's Hall, Hillsdale. Dr. Lord made an examination, and said, 'Her heart beats, but there is no breath. There is life, but no action of the lungs; I cannot account for this condition.' " Signed, "A. F. Fowler, Mrs. A. F. Fowler, Hillsdale, Mich., Jan. 1, 1891."